Maike Aden worked as research assistant for the first comprehensive retrospective on the writer and artist Ulises Carrión (1941-1989) which was organized in 2016 by the Museo Reina Sofia in Madrid and shown in 2017 in the Museo Jumex in Mexico-City. Presented on this site is a selection of presentations and contributions on the work of Ulises Carrión and its present significance in different cultural and national contexts. Very consciously, Ulises Carrión worked on pre-existing concepts, materials, technologies, processes and forms to give new visibility to the forgotten ghosts and ignored phantoms of our myths and ideologies. Moreover, all his work is based on the idea of mechanical reproduction. But, and this is decisive, he never ever repeated anything. Quite the contrary. Before he got bogged down by repetitive procedures, he gave a farewell to launch new expeditions into unexplored territory. Download Catalogue: Dear reader. 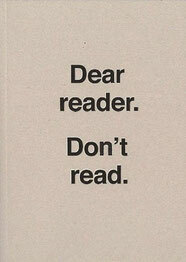 Don't read. “Forget hipness, coolness and glamour! Forget Damien Hirst’s golden calf and Marc Quinn’s gilded Kate Moss.... The time for blue-chip art is here. This also includes overlooked and underestimated artists from the 1960s and 1970s.” With these vigorous words, Marc Spiegler, director of Art Basel, promotes the exhibitors behind hip revivals. Such “hidden treasures”—a label invented by Art Cologne for this trend—have been discovered, venerated, and marketed for a few years now. In the spotlight of this cult of the (post-)1960s avant-gardes are primarily those artists whose aura was rooted in their supposed immunity to the established art system during their lifetimes. 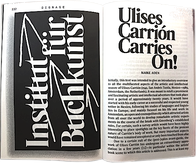 Among the most prominent protagonists are artists that include Bas Jan Ader, André Cadere, Poul Gernes, Lee Lozano, Charlotte Posenenske, and Paul Thek; and now, it seems, Ulises Carrión is also a beneficiary..."
This retrospective focusing on Ulises Carrión’s personal and groundbreaking approach seeks to illustrate all aspects of his artistic and intellectual work. The exhibition is composed of nearly 350 pieces that include books, magazines, videos, films, sound pieces, mail art, public projects, and performances, along with Carrión’s initiatives as curator, editor, distributor, lecturer, archivist, art theorist, and writer. It is a significant body of original work structured so as to place a spotlight on every facet of his production. Without losing sight of the unclassifiable nature of his oeuvre, this exhibition emphasizes Ulises Carrión’s constant search for new cultural strategies and the extent to which his projects were determined by two fundamental themes: structure and language, representing artistic guidelines that, influenced by a literary education, are pervasive in his work even if he always fought against it. This duality corresponds to the exhibition title "Dear reader. 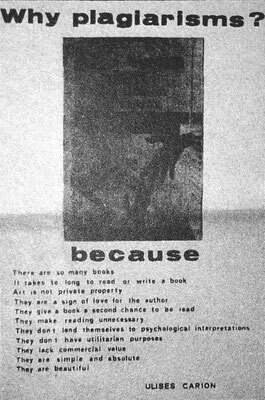 Don’t read"—taken from his diptych of the same name—which illustrates his ambiguous relation to literature, a recurring theme in his work. After being shown in Museo Reina Sofía Madrid, the Ulises Carrión retrospective "Dear reader. Don't read" will now open its doors in the Fundación Jumex in Mexico, the country where Ulises Carrión (1941-1989) was born and where he started his early career as a writer. With a sensitive and critical sense, and from the perspective of a former writer and linguist, Ulises Carrión (1941-1989) analyzed the internal layers of our language, images and sound, to test, reveal and thwart the rules behind their functioning. By using all phenomenas of daily life instead of the art system, he developed a contemporary as well as an anticipatory aesthetic program in which ideas, information and collective/participatory strategies were the basis for his very diverse art works, performances, exhibitions as well as his networking, distribution and archiving projects. All this he reflected in highly elaborated theories which seem to be - partly word by word - an early model of very recent art theories in the digital realm of the 21st century. Since several years, Ulises Carrión undergoes an extraordinary appreciation. 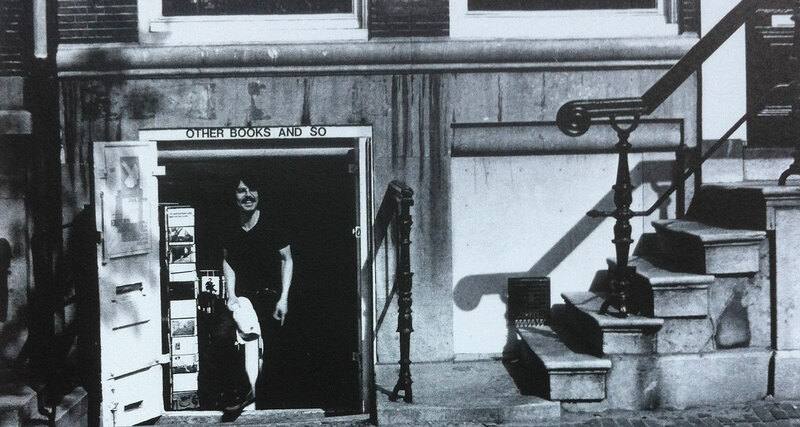 His legendary bookshop gallery Other Books and So is worldwide repeated and the widespread reception of his manifesto The New Art of Making Books, as well as made him the central reference for the definition of the concept of artists' books. On the other hand there is a strange caution towards his many other works, projects and initiatives. Therefore Ulises Carrión can be considered as a famous unknown insider tip with a pride of place in the hall of fame for mythologized figures. Based on his vast activities the presentation will develop the various aspects and contexts of the “cultural strategies” of Ulises Carrión, one of the most versatile personalities of the artistic avant-garde of the international post-1960s art scene. ULISES CARRIÓN : MODELE POUR LES ARTISTES CONTEMPORAINS?